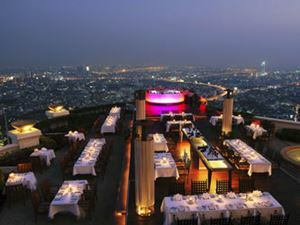 Cé La Vi (formerly Ku De Ta) helps guests pursue their pleasures by ascended to dizzying heights. Luxuriate in sublime surroundings while enjoying seductive beats and soul-stirring cocktails. Discover stratospheric levels of excitement at the Club Lounge, where a team of resident and internationally celebrated guest DJ’s represent the best of local and international acts. This upscale nightclub is located in Sathorn Square, steps away from Chong Nonsi BTS.